In the mesmerizing land of Ramnagar, Parthasarthi is a folk artist who practices Veeragase with his team of wonderful traditional artists. He is a part of Veeragase team that performs Tamtevaadiya and Veeragase. Parthasarathy is a very dedicated and sincere person who follows his passion for learning and teaching traditional art form. When asked about the art form, Parthasarthi stressed that the purpose of Veeragase is about adding the violent avatar of Lord Shiva also known as Veerabhadra. Parthasarthi along with his team has performed in various places like Delhi, Haryana, Pondicherry, Tamil Nadu, Orissa and various other states of the country. Approximately, the team has been conducting programmes for 15 years. The team experiences joy and has the prime objective of saving this art. After he settled down with his team, in beautiful dresses and masks we knew that it is going a worth watching the performance. In the shimmer clothes and elaborate make, they started to perform. The performance clearly showed their dedication and throughout the beats of the songs made us tap our feet too. The performance was fierce sit should be and hence was worth watching. Parthasarthi had learnt this art from his teacher Byrappa and also Mahesh. In order to learn this art, Nagegowda has built the entire Janapada Loka. It also had played a very important role. There are various people like Byrappa, Mahesh, Shivanna, Seenappa and others from whom he has learnt and exhibited this art. For Parthasarthi, this is the only profession and nothing else. He has taught in various schools and colleges like Bidathinahalli, Basaveshwara, Shyamala school, Karevinahalli, Channapatna Government First Grade College, Bengaluru GKVK college and many other colleges. According to him not only video but also audio recordings of the performance have been done. However, he is not sure where they are as of now. He is keen on teaching the art form to his children so that it can be passed on to the next generation. 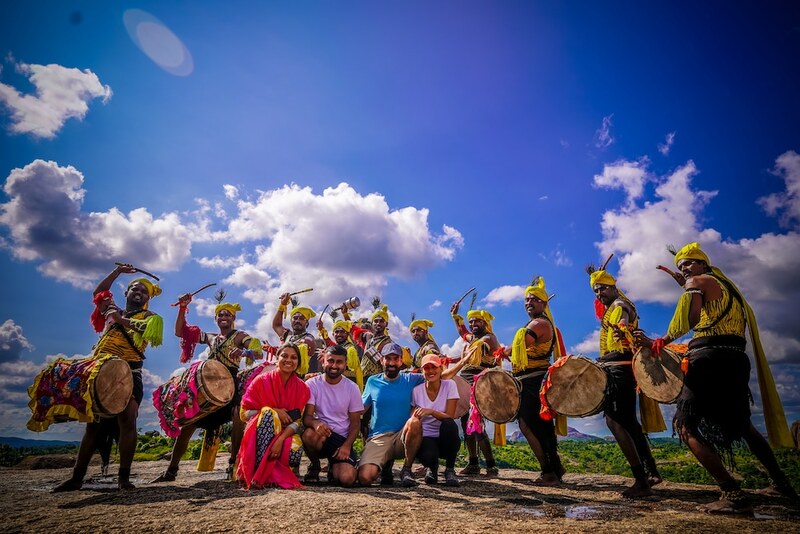 We feel that this art form practised by this team of dedicated and hardworking individuals should be highlighted and made to reach out to the vast audience all over the world. This group and the art form required an applause from all over the world. According to Mahesh, as far as the origin of Dollu Kunitha is concerned, it is said that there was a demon named Dolla-asura. He prayed rigorously to Lord Shiva. In return, he requested Lord Shiva to grant him a wish. Dolla-asura swallowed Lord Shiva. After being swallowed by Dolla-asura, Lord Shiva grew in massive proportion inside the demon’s stomach. Being unable to bear the pain, Dolla-asura pleaded Lord Shiva to come out. Lord Shiva came out by tearing open the demon’s stomach, killing him in the process. Lord Shiva used the demon’s stomach and the skin to make the drum. The demon’s arms were used as sticks to beat the drum. The demon’s intestine was used to make the band wear the drums around the neck. Lord Shiva expressed his anger through this violent form of dance. This basically is a well-known form of art and dance in Karnataka. Districts like Gulbarga, Raichur, Bidar, Shimoga and Sagar have been credited as the cradle of this form of art. This form of dance flourished in these places. And, Mahesh and his team have carried this forward in the last 20 years. They have been practising it has their livelihood as well. Mahesh had learnt this art from a renowned Janapada Loka trust at Ramanagara. After learning this art, he has also passed on the knowledge of this art to at least 500 people across various schools and colleges. Mahesh and his team have been professionally practising this art. It is a source of their livelihood. The revenue earned from it is used to lead their life. Mahesh has been learning this art from the age of 20. He is keen on teaching this art to his children. However, as they are too young their education that is reading and writing seems to be the focus as of now. He would definitely give a thought about teaching them this art at a later stage. As not many people are showing interest in this form of art, Dollu Kunitha faces a serious threat of being extinguished. Mahesh feels that if such a scenario presents itself, he would fall back on agriculture for revenue. Some of his team members have appointed jobs. And, some work as drivers and farmers. However, Mahesh strongly feels that Dollu Kunitha is their team’s main profession and he would like to grow as a full-fledged folk dancer. According to him, the elders in the family mostly depend on pension fund given by the government. According to Mahesh, his team members are versatile and can perform various jobs. While some are drivers, farmers there are others who have taken up government jobs. However, for a few of them, Dollu Kunitha is the sole profession. Apart from this, he believes in moving on with life as per the God’s will. This art is their life. And hence, they are pursuing it. The Kangilo group is led by Prashant and Shekar Bykadi who live in Kalyanpur village, Udupi district. The folk form they perform is a religious devotion in the form of dance. They initially started off as a drama artist and later on got involved with folk art and dance as well. They support all the artists for giving performance throughout India. Shekar with being an artist is also a public speaker and imparts training on human relations, communication skills and leadership building. His family did not belong to this field. But his first encounter with drama started when he was in 8th standard when he performed Yakshagana. He then moved on to drama acting training. He was fortunate enough to be trained by top most directors like Prasanna and Champa. Currently, he is continuing by devoting equal time to drama and dance. With Shekar and Prashant, the group wishes to be active in this field and also like to create peace with domestic activities. Their dream is to support folk dance and drama but does not prefer to work in films or any other activities that do not promote our culture. They are inclined towards folk dance and modern theatre drama. Shekar is also imparts training to students in many colleges and schools. And, so far many students have been guided by him. Being involved in social work has given him recognition and popularity in his locality. He also conducts humorous programs for birthdays and weddings which has resulted in fame. In the field of drama, he has contacts with people like professors and lecturers. Even to this day, he continues to give performances. The group has performed in various cities and won many awards. In the elocution competition, he got first at the state level in Karnataka. The form of music they perform is only classical which includes Janapada songs. In the drama, there are domestic songs. In Kannada, it is known as Ranga Geethe. In the group, Shekar is the one who also has written such songs and also pens articles. 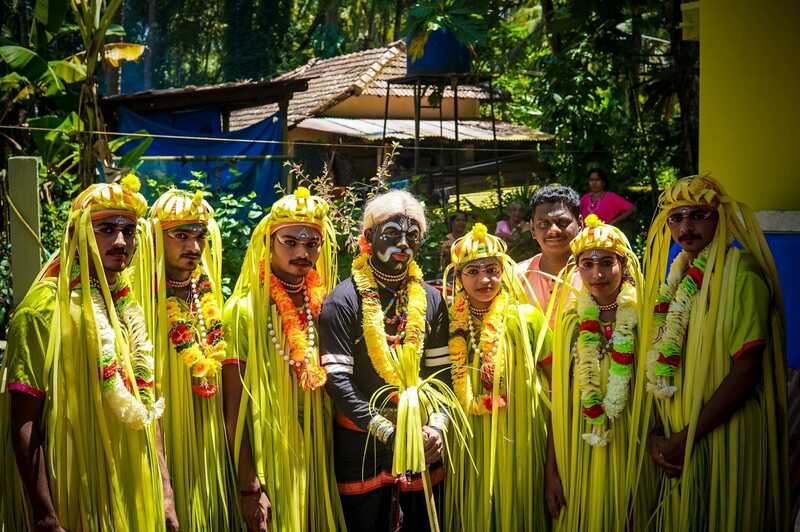 Upon reaching their house in Udupi we were stunned with the dedication they had put in arranging the costumes made out of the fresh palm leaves and the beautiful intrinsic makeup put upon them. 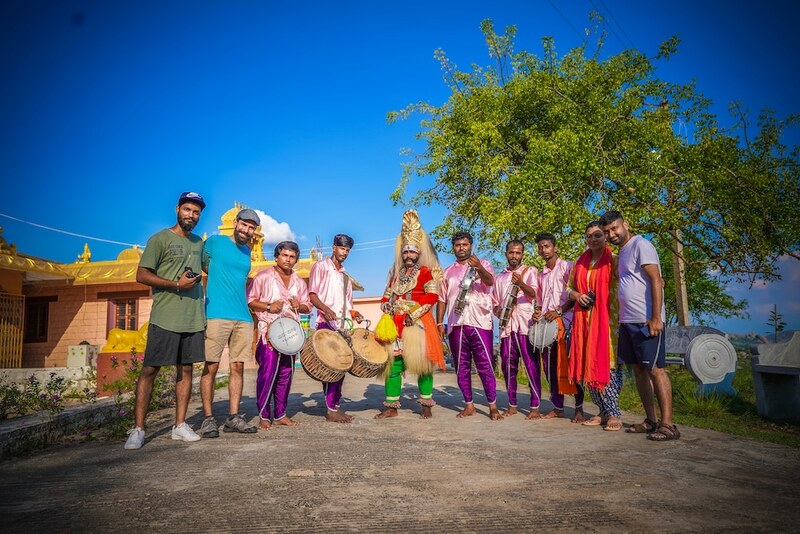 With the preparations done they went ahead to the performance which was done at the bank of the backwaters few kilometres away from their house. The performance was highly applauded by the locals who saw it then. Prashant and Shekar are determined to take this rare art form to a wider platform and in this Anahad Foundation is definitely going to help them.